SparkPeople has a ton of amazing tools other than just food, exercise, and water trackers. There is a whole slew of community boards including a mobile one on their app. Plus you can’t beat the valuable support you can receive there. Like I mentioned above there are also articles and recipes, blog posts, and much more. MyFitnessPal also has a community and much more on their website. I couldn’t find any recipes but they have an expansive database of foods with mainly reliable nutrition information. When I’m on the go, I sometimes use them to search how many calories are in certain foods. Calorie Counter same could be said of this one for on the go calorie content viewing. I have found it is more or less reliable with its information as well. Livestrong has proven to be an accurate and reliable site in my opinion. They have a lot of helpful resources there as well: you can track exercise and food, post to the community, read articles and blogs, search the recipes, etc. Mayo Clinic is reportedly one of the more accurate websites with health information. WebMD is good for basic things, although you still might freak out quite a bit if you’re googling symptoms or a specific illness. Either way it’s best to visit your own doctor if possible! Check out some of these websites if you wish! They can be pretty helpful if you play around and explore a bit! They have been great resources for me at least on occasion. Okay so it’s not the best way to cook chicken per se, but it is my favorite way to cook it in a healthy way, which is simply to bake it in the oven. This way is so healthy, easy, and tasty at the same time! First I preheat the oven to 350˚F. Then I rinse the chicken and cut it up into whatever size piece works, unless I use tenderloins which don’t need to be cut. Place the pieces on a baking sheet that has been sprayed with non-stick spray. Season the pieces with whatever I want to use, usually pepper, garlic, or Italian seasoning or a combination because that’s what we have on hand here. Throw it in the oven once I’m sure it has adequately preheated. Cook for 15 minutes, sometimes 20 minutes depending on the size but they are always ready by then! They always come out juicy and tasty, without using any oil or marinade. This way won’t work for everyone and I don’t have fancy tastes, but it works for moments when things are crazy and we need a healthy home cooked meal! Chicken salad with whatever veggies we have: lettuce, cucumber, and tomato is my favorite. I use light ranch dressing because I prefer it over all else and it’s only 80 calories for two tablespoons. Brown rice + baked chicken + veggies: I love putting cauliflower, broccoli, and/or corn in this dish! You could even stir fry it in a skillet. Noodles + baked chicken + veggies: This I can use any veggie and it tastes good: green beans, broccoli, carrots, corn, etc. Preferably you would use whole grain/wheat noodles if you chose to do this, but sometimes when we don’t have that I’ve been known to cook half a package of Ramen noodles plain, no seasoning. Now I know they aren’t healthy at all but it works in a pinch. This could also be cooked as a stir fry with the right noodles! White chicken chili: I need to find and share this recipe with you all because it is so tasty. You could do a search online and find one too but I will be posting this in a future post! There are countless other dishes to mix the chicken with as well, like a ton of chicken casseroles or other recipes, but these are my favorites! There is a treat that I’ve recently discovered in my search of getting more protein in my daily diet. I had tried Greek yogurt a few times previously, but only ones with the fruit or fruit flavoring already added, and it truly grossed me out. So it kind of put me off of Greek yogurt for a little while. However, I didn’t give up that easily. I kept getting drawn back to it. One shopping trip I decided to try vanilla/plain Greek yogurt and mix it with my own fresh fruit at home. So I grabbed a four pack and brought it home, determined to make it work somehow. First “recipe” I tried was to mix the Greek yogurt with a whole diced banana and a tablespoon of peanut butter (half a serving). And OH MY, was that tasty! It was so delicious! 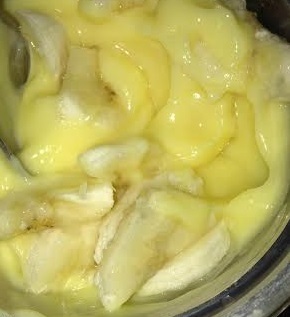 It really reminded me of banana cream pie with a hint of peanut butter. 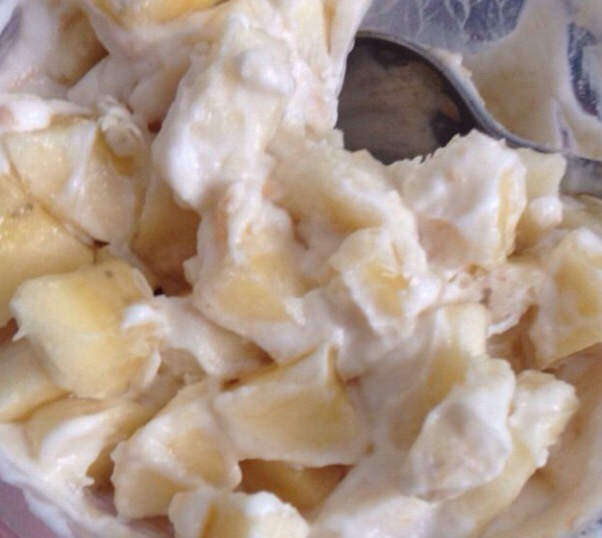 Due to oral surgery this week and a lack of bananas in the house, I ended up trying the Greek yogurt with just 1 1/2 tablespoons of peanut bugged mixed in… and it still tasted absolutely delicious. So even if you don’t like bananas or are like me and don’t have them in the house at any particular moment, try the Greek yogurt with just peanut butter mixed in.